I thank the Volunteers of the Shroud and also those who have helped me in my visit to Turin. I cordially bless you and your families. And please do not forget to pray for me. May the Lord bless you and keep you Madonna. More than 1 million euro was collected during the Exposition and donated to the Holy Father. It will be used for charitable works in Turin. It was an exposition of the most participated and experienced by pilgrims for human and spiritual intensity. The organization and the welcome was perfect also for the kindness and friendliness of the volunteers. The path toward the Shroud proved useful with panels of social saints and with the movie of the prefetch, both judged by all well made ​​and necessary. All pilgrims then had the opportunity to pause in silence and prayer before the Shroud for a sufficient time. Very large and varied profile of the pilgrims: families with children, young people, the homeless and the poor, Orthodox and Evangelicals, Muslims and representatives of other religions, people from European countries, America, Africa, Middle East and Asia. Of particular note is the thousands of visitors Filipinos. They stopped in front of the Telo numerous cardinals, bishops, priests, deacons, men and women religious, ecclesial associations and movements. Thick delegations of pontifical councils of the Holy See and the offices of the CEI. They are also parades in front of the Shroud political authorities, economic and financial, entertainment, sports, film and theater. The total number of pilgrims visiting the Holy Shroud in the monstrance Costituto 2015 is the sum of the people who have booked and have made ​​the journey, those who participated in the celebrations in the Cathedral, the groups walked right through the door without central reservation and authorities and personality accompanied by the Ceremonial. With this calculation, the number more than two million people. To these must be added those in the two-day visit of the Pope have followed him all the way from Caselle in Turin, in all the squares and streets where past and has stopped . We can say, then, that Turin has received 3 million people. We have received a number of messages and endless claims of what the experience of the Shroud was intense and full of grace and joy for the pilgrims. Pope and all his followers were surprised by the enthusiastic welcome of the people, a sign of great affection for the Pope. The Pope’s speeches and his actions have hit the mark and will remain in the hearts of all as an invitation to hope and confidence in the future. The actions of the three representatives of the world of work were concrete, realistic and not of fact but also loads hope in God and in themselves. A good injection of optimism even in the middle of the well-known difficulties. The Pope has asked me to take advantage of the gift fruit of donations from pilgrims and Exposition of the faithful of the diocese of Turin, for a work of charity in favor of the latest in Turin. The figure exceeds one million Euros. We will define these days with Caritas, Migrantes Office and Ministry of Health which will make it work. 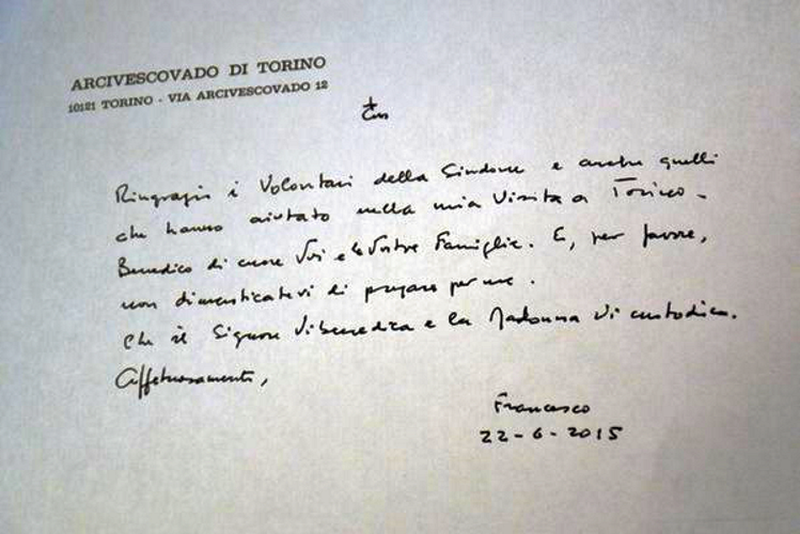 The Pope has also written a note of greeting and blessing to the children who greeted him in Piazza Solferino and on the way to Caselle . 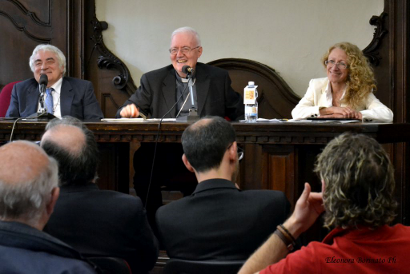 We will do have to all parishes, will be published by the Voice of the People and of http://www.sindone.org. The text says: “Dear children, I left Turin after my visit, bearing in our hearts your joyful greeting, I have blessed and I invite you to always be friends of Jesus and of you, to give everyone his Gospel of love and peace. I cordially bless you together with your parents, priests and leaders. Pray for me. Francesco 22.6 2015 “. From the speeches and gestures of the Holy Father will derive a pastoral letter to the city and to the Diocese because both the support base of our common path for the next years. I Exposition of 67 days have left a mark on the city. I am proof that Turin knows mobilize in all its various social and economic components. Turin has been able to field his best forces, for the visit of Pope Francis where 600 firefighters who served together with the police and the prefecture to ensure everyone a peaceful performance of the two days. It was enshrined in the ability to collaborate between different parties to achieve common goals.Working together is the key to achieving the best results. This is demonstrated by the work of the Diocesan Youth Ministry who welcomed thousands of young people from around the world, the Ministry of Health who coordinated initiatives shelter for sick and disabled, including the Home, and collaboration with associations working in prisons Le Vallette and Ferrante Aporti. It also shows the sensitivity of the business community who have contributed in various ways all’ostensione. All these examples confirm that Turin is on track to build a culture of welfare and that makes us look to the future with greater confidence. I have not seen the Shroud in person but rely on Shroud Story and other sitea on the internet. Time’s Square Who Is He?